The Cellular Church, a UB hispanic church, has withdrawn from the denomination and joined the Missionary Church. The church, located in Canyon Country, California (the Los Angeles area), was perhaps our most successful church plant in the last 20 years. The church started in 1994 under the leadership of Pastor Edwin Recinos and, in 2005, reported an average attendance of 505 people. The Pixley UB church in Pixley, Calif., is now the only United Brethren church in California. Rocky Spear has been named senior pastor of Mongul UB church in Shippensburg, Pa., effective January 21. He previously served on staff at Colwood UB in Caro, Mich.
MLive.com has an article about Rick and Jan Talbert of Heart of the Lakes UB church in Brooklyn, Mich. After Rick spent 11 days repairing roofs and damaged walls in Biloxi, Miss., following Hurricane Katrina, he came back to Jackson, Mich., and began helping local people with various needs. And the church got involved, too. For instance, a group from the church spent the summer painting the home of a disabled woman and paying for new windows. Click the link above to read the article. Just finished the book, Healing The Heart of Your Church. I recommended it earlier and I would echo that earlier recommendation. Much in this book relates to our churches. I hope to place some emphasis on corporate repentance at the National Conference. You might like to get a copy and read it before then. If you have trouble finding it, let me know. You can order it from our bookstore by calling 1-888-622-3019. One of the books that I started this week is Christian Coaching, by Gary Collins. So far it is a good book on the topic. I am reading it because, for some time since being in this office, I have felt the need for a coach to help me keep and stay focused, among other things. I recently entered into a coaching arrangement with a gentleman whom I respect greatly. I was a basketball player in my younger years and have dealt with coaches in that area of my life. I was blessed to have several men mentor me in my early Christian walk. I have been encouraged by many people in my life, but I’ve never really had anyone to coach me since I left sports. So, we’ll see if you can teach and old dog new tricks. Have a great Christmas and New Year. I hope your team wins its bowl game! Go Buckeyes! I have been struggling since Monday evening with Vertigo and all that is associated with it. If you don’t know what that is I’ll spare you but is has something to do with meeting up close and personal a porcelain object kept in a small room in the house. Anyway, I did it to myself. I had purchased a new de-humidifier for the basement and of course that was some assembly required as I wanted it to drain to the sump. Hooking up the drain hose I had to bend over and look in an opening to attach the hose. Bending over and looking up at the drain attachment “thing-a-ma-jiggly” I gave myself a good case of vertigo. I’ve had this ability (I’m not so sure it is an ability as it is a curse) to make myself sick by bending over and looking up at something. Sometimes just laying on my back and looking up will do it. But it is an experience I can definitely live without. As soon as I bend over and cocked my head to look under the de-humidifier I realized I had made a serious mistake. The room began to spin and I immediately got sick and it is hard to run to the bathroom when the whole place is spinning like a top. Anyway, to make a long story shorter, after a trip to the doctor and getting 3 prescriptions I am doing better today. I can walk reasonably straight and the world is staying in place instead of spinning. As I have had the privilege of sharing the Strategic Plan for the future of the UB Church, I have heard a call from key leaders: make accountability real. We have spoken about setting goals for reaching the lost so that we are working strategically. It makes sense that if you don’t intentionally seek to reach five people for Christ, you won’t reach one. Setting goals in no way removes the Lord from the work. Nothing can happen apart from Him. The goals are simply our faith in action in an intentional, strategic manner. The question is this: Am I willing to be held accountable? Or would true accountability bring to light my failure to work in a systematic way that frees the church to reach lost people? Would it show that I am simply taking care of keeping already saved people happy while not making them or others true disciples of Jesus Christ? Many want to settle for fellowship as a standard of good meetings. We support each other and pray for each other. But fellowship without accountability will not help us mature and grow in ministry. This question must be answered by us all. It is key to the future of our ministries. 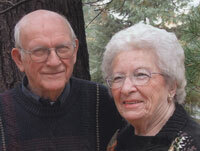 Charles and Doris Malson celebrated their 65th wedding anniversary on November 19. They were married on November 19, 1941, at the home of Doris’ parents near Camden, Mich. The Malsons served in the pastorate for many years in Michigan. After five years at the Brown Corners UB church in Clare, they founded the Richfield Road UB church in Flint, Mich., where they remained for over 24 years. Before retiring, Rev. Malson served as fulltime conference superintendent of Michigan Conference for ten years. Charles and Doris remain active at the Mount Hope UB church in Carson City, Mich. They have a home on the Carson City campground. Recently, while out on a hunting trip in northern Michigan, I saw a rare and beautiful sight — a bald eagle in flight. The very first time I saw a bald eagle was on that same hunting trip a few years earlier, when an eagle swooped down to grab one of our duck decoys. In my excitement, I spun around and shouldered my shotgun before realizing the true identity of this over-sized Mallard. (That day I thanked God for my hunter’s safety course mantra; “always identify the target before firing.”) As I lowered my shotgun and watched the eagle flare and with a few strokes of its powerful wings soar out of sight, I was moved by the beauty and strength that God has designed into this creature. Someone recommended to me the book by Bill Easum, Unfreezing Moves. It is not a brand new book, having been published in 2001, but it is worth reading. While I do not agree with everything Easum says, I found the book to be challenging and worth the time to read it. Reading it is the simple thing to do. Acting on what it teaches is not so simple. The book’s focus is on helping readers identify their church as “stuck or unstuck” and then give the prescriptions needed to become “unstuck” as a congregation and follow Jesus into the mission field. Chapter two, “The Systems Story,” is a particularly good chapter if you have never thought about the systems that are in a church. But section two, “Unfreezing Moves,” where Easum takes 9 moves that a church needs to make in order to become unfrozen, was worth the price of the book. My heart aches when I go out to many of our churches and find them controlled by people who are carnal at best, who just want to control everybody and everything. That, by the way, may be the pastor as well as the people. Many of our churches have been and are being choked to death by unspiritual controllers. I used to say, “O but they mean well,” but I’ve changed my tune. I am not sure they mean well at all; they just want their own way and control. If they meant well, they would be willing to look at their ministry area as a mission field, themselves as missionaries. and be wiling to move heaven and earth to see lost people come to Jesus. Sad to say, but most controllers are not even interested in seeing lost people come to Jesus. They are only interested in controlling the status quo. We need leaders with the courage to lead in new directions. If you think you are one, then reading this book, especially Part Two, will give a good overview of what your task is. If you are one of those leaders and you decide to challenge the status quo, I will be your biggest cheerleader. Pat Jones, Mark Ralph, and I spent this past weekend at Banner of Christ UB church in Grand Rapids, Mich., conducting our first Church Consultation Weekend. The initial response was very positive. These consultation weekends are a crucial part of the Strategic Transition Plan developed to transition our churches into becoming healthy, vibrant congregations that are missional in mindset with an outward focus on reaching lost people in our communities. While I realize that the consultation weekend is just the first step in the process, it is an important first step that gives a congregation a snapshot of where they are, where they want to be, and a roadmap for the journey. This consultation weekend is not–and I repeat, not–something that we require for all of our churches. It is not a program you must buy. Rather, it is a service we provide to any church that desires our help in evaluating where they are, where they want to be, and the steps to get there. So, any of our churches that want such a service may contact my office and we can discuss further what is required and a time frame. Right now, the consultation team is myself, Pat Jones, and your cluster leader (Mark Ralph, pastor of the UB church in Sunfield, Mich., is Banner of Christ’s cluster leader). Both Pat and I received training to conduct these weekends, and in January we will expose all of our cluster leaders to some initial training in the process. A second consultation is already scheduled for another Michigan church. Again, this is entirely a service we provide to our churches. Some churches may never need such a service, and that is great and fine. But others might see some real benefit from it. I’d be happy to talk with you. But here is the bottom line: whether or not you schedule a consultation weekend is not an issue with me. Seeing our churches become healthy, missional, with an outward focus in reaching their community–that is a serious issue with me. What I want from our churches is not the issue, either, but what God wants. And he has told us what that is: make disciples (Matt. 28:16-20) by evangelizing, educating, and enlisting. If this office can help you become engaged in this great task, all you need to do is ask!